The Guild Hall Grand Opening Week - The Guild Hall Cluj - Board games anticafe. Cowork. Events. 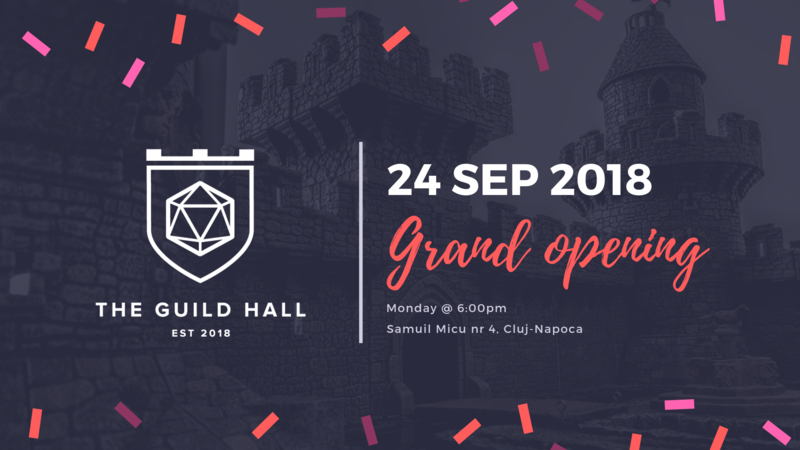 The Guild Hall opens its doors: 7 days of celebration for The Place created around the passion for tabletop games! Step into our world, a playground for games, co-work and geeky events. We are a community – let’s get together! All throughout the week, it’s 50% off our Day Pass entry fees (except Monday, when entrance will be FREE). We’ll also have daily raffles giving out monthly memberships and store gift cards, with a grand raffle on Sunday. Mondays can be about fun & games too. Come to meet us, enjoy a welcome drink, check out the space, get a guided tour or simply play some board games. FREE ENTRY on our first day – don’t miss out! On Tuesday, The Guild Hall will be the host of all sorts of games that are played with miniatures. Members of different communities will be present and happy to teach you any of the available games. You will find the grim battlefields of Warhammer 40k and Dropzone Commander, the fantasy lands of Age of Sigmar and Pantheon Mythic Battles, the popular Star Wars Imperial Assault Skirmish and many many more other games. What is a good board game? A game that can be enjoyed with your friends in a wonderful setting. So today we celebrate just that, the joy of boardgaming and meeting new people and learning new games. Join us at one of the many tables and play an old or a new game with our staff or with other geeks hanging out at The Guild Hall. Are you a horrible person with no morals? Great. This is the competition for you. Join our little tournament and come on top as the most terrible person at the table. Sensitive people need not apply. No prior registration required, you just need to show up and take a seat at the table. We’ll be using the base game and a few expansions. Fun will be had in all the wrong ways. Yes, there will also be a prize; we’ll keep that a surprise for now. Let’s play pretend. Take the role of an imaginary character in one of our games and go on a wild adventure. Skilled Dungeon Masters will await your arrival and together you will learn about the fantastic world of role play. The Age of Sigmar community will be present to demonstrate and teach you the core mechanics of this fantasy miniature game. You will be provided with all the necessary things to play the game including explanations and miniatures. And dice. Lots of dice. With the Nationals coming next month, this is your opportunity to flex your Carcassonne muscles and defeat your opponents in a casual Carcassonne competition. Also prizes. In the evening we will gather all the talented people who paint miniatures and hold an Award Ceremony to reward the most skilled of them all. The Guild Hall invites you to the first Catan Tournament we’re putting together in our new space during our Grand Opening week. You have the opportunity to participate in an exciting competition, while paying us a visit at the new location and getting to know our team. Get ready to trade, build and win fantastic prizes. While the Catan Tournament is in progress, we will also host a grand battle in the Warhammer 40K realm. Two huge armies will meet in an apocalyptic game that will leave you speechless.